CBT (cognitive behavioural therapy), EMDR,counselling and psychotherapy are some of the most common talking therapies and can really help those with anxiety deal with the emotional causes of their anxiety. Childhood difficulties such as trauma, neglect or difficulties experienced at an early age can leave emotional scars which later on life manifest as anxiety. Our busy, hectic lifestyles often result in people operating at ‘full speed’ and with very little down time we can experience emotional overload, which can show itself in terms of anxiety. Talking therapies allow you space to work through the issues in your life, coming to terms with any difficulties and for many, being able to better manage the potency that these difficulties often have. Anxiety help - Which talking therapy is right for me? The answer for this will be different for each individual – what works for one may not work for another. Our team of clinical advisors, who take all our enquiry calls, are qualified as psychologists or psychotherapists and are able to work with you to find the right therapist for you. CBT (cognitive behavioural therapy) focuses on the relationship between thoughts, feelings and behaviours. There is a strong evidence base to support its effectiveness in helping treat common mental health issues such as depression, anxiety and phobias and is one of the most commonly used talking therapies in the NHS. It does not suit everyone though, particularly because it is often ‘solution’ focused and so some people may benefit from anxiety counselling or psychotherapy. You can read more about CBT here. 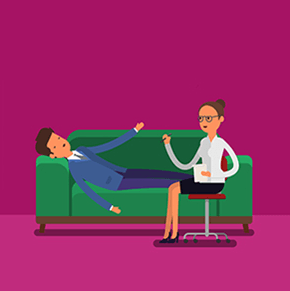 Anxiety Counselling and Psychotherapy – within these talking therapies are many different types, such as humanistic, psychodynamic, dialectical behavioural therapy and psychoanalytic. You can read more about types of counselling and psychotherapy. EMDR was developed in the 1980’s by a psychologist who was interested in how our brains could be ‘reprogrammed’ to overcome distressing memories and thoughts. You can read more about it here. To talk to one of our clinical advisors about finding a therapist that is right for you please call 0203 326 9160.